Stretches, even as minimal as repeatedly making a fist can minimize wrist or forearm problems. Golfing can cause repetitive stress injuries (RSI) in the neck, arms, legs and chest, to name a few. But while repetitive stress injuries can sideline even the most fit golfer, there is no reason why you can't work your way back to health and be back on the links in no time. With some no-nonsense exercises and a little patience, you can undo some of the damage done by repetitive stress injuries. But if you do not improve, you should seek medical advice from physicians who specialize in sports injuries to guide you through your recovery. Place the tips of the fingers at the tops of your palms, touching the pads at the base of the fingers. Slowly open and close this "short" fist slowly 10 times. 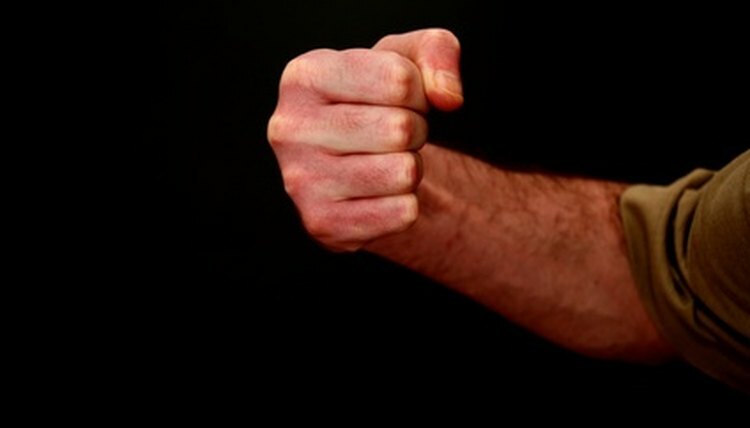 Place the tips of the fingers in the middle of your palms, as when making a fist to punch something. Slowly open and close this "punching" fists 10 times. Place the tips of your fingers at the base of your palm, touching the meaty part above your wrist and at the base of your thumb. This "long" fist should be opened and closed slowly 10 times. Put your arms directly out to the sides of your body, palms outward. Bending at the elbow, bring your palms up and point your fingers toward your ears. Stop when you feel tension and hold for a few seconds. Slowly release back to starting position and repeat 10 times. Put your arms directly out to the sides of your body again, but with your palms down and making a loose fist by curling your fingers in toward the palms. Lean your head to the left slowly until you feel tension, then stop and hold a few seconds. Return to the starting position and lean your head to the right to repeat the exercise. Repeat 10 times for each arm. Sit in a chair and put your left leg straight in front of you. Slowly bend the toes toward your chest, stopping when you feel tension. Hold for a few seconds, then slowly return to your starting position. Repeat 10 times, then switch to the right leg before repeating the exercise. Stand facing a wall, feet together. Step back with your left foot and slowly place the heel toward the ground. Stop when you feel tension and hold for a few seconds. Return your left foot to the starting position, then repeat the step backwards 10 times. Repeat this exercise for the right leg. Sit directly on the floor, knees bent and your feet crossed "tailor style." Place your elbows on your knees and begin leaning slowly at the hips over your knees. Stop when you feel pressure and hold for a few seconds. Return slowly to the upright position, then repeat 10 times. Alternatively, you can sit in a chair and cross your left leg in front of you with your ankle resting on your right knee. Place your hands lightly on both knees and lean forward over your knees, stopping when you feel pressure. Slowly return to the start position. Repeat 10 times per leg.